We are proud to announce our 4th online auction at Sixbid and Biddr. The Coin Cabinet auction 4 is now ready and it will run live on June 4th, at 3 PM BST. We accept bids from now 12 PM on the 4th June. Bids can be placed via Sixbid, NumisBids, Biddr or email. All lots will be displayed at the London Coin Fair on June 3th. Please come by our stand if you are there! Alternatively, most of coins can be viewed in our Youtube channel. As London, UK based business, we are always very keen on Great Britain coins. We have prepared a really interesting and high quality coins’ selection, such as crowns, Commonwealth, Anne (3), George II (2), Victoria choice UNC 1893 toned, high grade 3 shilling bank tokens; 1811 proof, Sovereign 1849 Roman I mint state, 2017 long proof set in original case; just to name a few. Lot 172. GREAT BRITAIN. Victoria, 1837-1901. Gold Sovereign 1849, London. Roman I. S.3852. Roman I in date. The best we have seen, exceptionally rare in this condition. In 1849, there was only one type of shield sovereign. This sort, which has the second portrait, issued from 1848 to 1872 (with some gaps) has a larger head, and the reverse legends are repositioned. All 1849 sovereigns are exclusively London mint and with out a die. Queen Victoria is one of the most famous royals of Great Britain. Queen Victoria, the only baby of Edward, the Duke of Kent, and Victoria Saxe-Saalfield-Coburg, sister of Leopold, King of the Belgians, served as Queen of Great Britain for sixty three years. Thus far, she is the the second one longest reigning British monarch after Queen elizabeth II. In 1840, she married her cousin, Prince Albert. As a sturdy woman, Victoria proposed to her husband, Prince Albert. At first, British public didn’t like the German prince and he was excluded from holding any legitimate political position. At times their marriage seemed tempestuous - a clash of wills between two extraordinarily strong personalities. However with a time Prince Albert have become her most important adviser, assisting her in difficult political situations. Queen Victoria earned the adage: “The sun never sets on the British Empire.” 19th century was also called Victorian England because of Queen Victoria’s long reign and the indelible stamp on the country. Victoria's period saw amazing cultural expansion; advances in industry, technology, and communications; and the building of railways and the London underground. She died in England in 1901. Lot 151. GREAT BRITAIN: BANK OF ENGLAND ISSUE. George III, 1760-1820. Three Shillings 1811, London. S.3769. Near FDC. 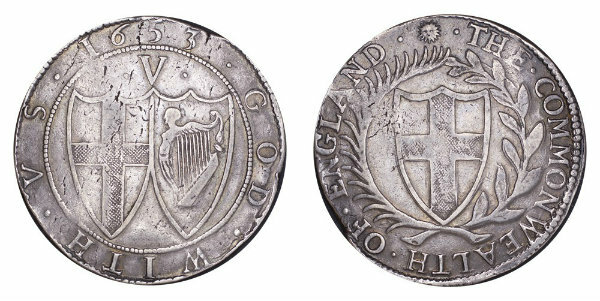 Regardless of this being a long rule, the quantity of silver and copper coins issued by the Mint in the Eighteenth Century was little. The silver coins of George III comprise of two essential parts, 1760-1815 and 1816-1820. This was a time of big change both in the British Empire and in it's coinage. There was just a solitary issue of silver preceding the colossal recoinage of 1816, being Shillings and Sixpence, in 1787. This deficiency drove straightforwardly to the huge issues of token farthings and halfpennies in the 1790's, and the issue of silver tokens and Bank of England tokens in the period up to 1816. Lot 140. Commonwealth (1649-1660) crown, silver coin, dated 1653 with Sun mint mark. This coin has been used from 1649 to 1660. Legends: ‘The Commonwealth of England. God with us’. Latin engravings has been changed for English, and the bust of the monarch is no longer on the front-side (in spite of the fact that on coins approved from 1656 onwards demonstrate a return to tradition with a bust of Oliver Cromwell). This prior, more straightforward outline demonstrates the shields of Saint George's cross and the Harp of Ireland one next to the other. » The Best Time to Buy Gold Sovereigns?